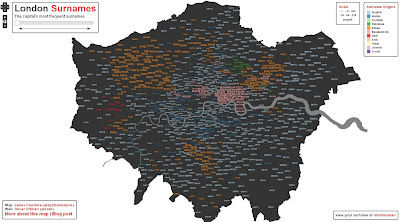 Some inquisitive bloke has mapped the city of London by the frequency of surnames, and produced a nifty interactive web doogizmo to see who's who, where. If you move the slider at the top left, you can see the map with the first to fifteenth most common name for the areas displayed. I know a lawyer that does nothing but get permits and arrange financing for motels, gas stations, and convenience stores in New England. He has a big, rubber stamp that reads Patel, too, to save time filling out forms. Lucky London....well maybe not as having been there quite often in the past I wouldn't wish the place on anyone. Interfriend extraordinaire RAA in da house.